With all due respect to The Wooden Birds, the billing was backwards last Thursday at the Crofoot in Pontiac. Andrew Kenny's thoughtful musical arrangements and lyrics reminded us of driving across the open farmland and prairies of middle America: steady rhythm, soft undulations and a clear view of where you're headed. The Austin, Texas-based band (pictured below) and their mellow, southern-inflected brand of ambling country rock was no doubt well-received in Louisville, Ken. where they played the night before. But based on heads alone Dan Mangan was the headliner in the Pike Room that evening, and it was obvious that audience appreciation-- which included our fellow CBC Radio 3 bloggers Wapuche and jojodillon-- went far beyond body count. 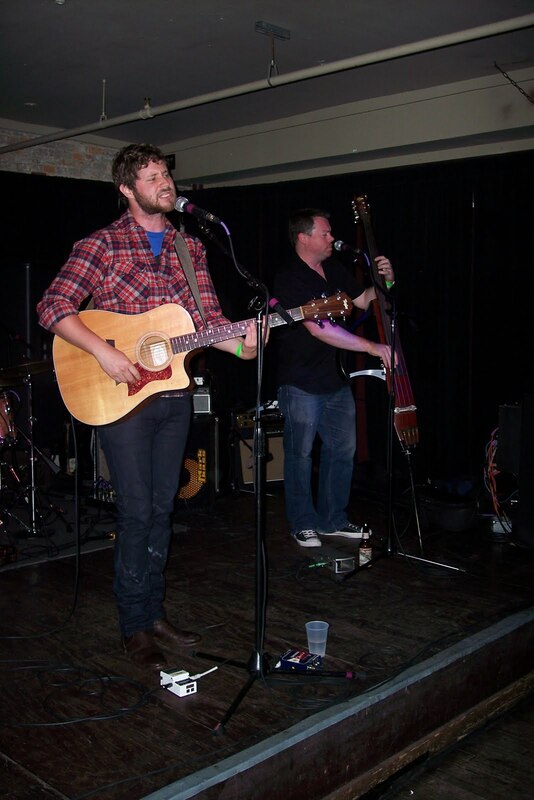 A confessed introduction to Kentucky bourbon in Louisville appeared to have no affect on Mangan and his band: guitarist Gord Grdina, bassist John Walsh and drummer Kenton Loewen. They enthusiastically delivered the majority of Nice, Nice, Very Nice, a few selections from Postcards And Dreaming plus a new song composed while on tour, concluding with a rousing "Robots" sing along. Mangan seemed genuinely surprised everyone knew the words. So were we. Ring the bells that still can ring and sing your stupid head off to the ones who are not listening... We're listening, Dan. We're listening. 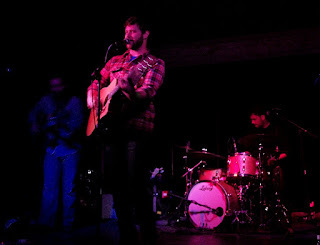 @danmanganmusic Will Wooden Birds be with you in Detroit next week? @Go_N2Det_S2Win in Pontiac? I believe so! On the other hand, Wooden Birds will be largely unknown to us. Somehow American Analog Set is off our radar, although we can certainly appreciate Andrew Kenny's association with Broken Social Scene. 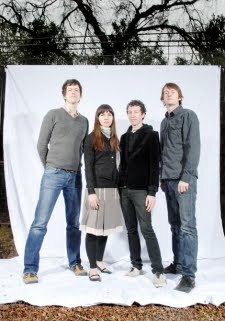 We like what we hear on their MySpace page and are looking forward to getting to know them better. 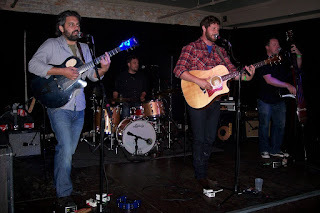 While we're waiting for Dan Mangan on Thurs., Aug. 26 at the Crofoot's Vernors Room (Dan may or may not be opening for Wooden Birds; we heard they'd canceled but now it appears they're on again), we thought we'd wax poetic about poutine. If you're Stateside, you may not be familiar with poutine (poo-teen, or check out the French pronunciation on the poutine Wiki page). It's not a Canadian indie band, but it does go with one very well, before or after a show. Poutine is a Canadian culinary treat that originated in Quebec: French fried potatoes topped with cheese curds and gravy. It doesn't have a particularly long tradition. My friend's mom, a Quebec native who left in the 1950s, had never heard of it. But it is gaining in popularity and definitely has a lot of passionate consumers. Purists demand only freshly prepared potatoes (not frozen crinkle-cut fries), fresh cheese curds (also known as squeaky cheese; if the curds were finished correctly and aged, they would result in cheddar cheese) and a light gravy (poultry- or veal-based; vegetarian gravy is used as well). We think poutine is a culinary trend waiting to happen in the Detroit area. After all, Detroit loves its chili-cheese fries. For now, the best place we know of locally to enjoy poutine along with a side of Canadian indie music is Windsor's Phog Lounge (be sure to scroll all the way down for the menu and prices). CBC Radio3 bloggers invade Phog! How much do Radio 3 bloggers love Canadian Indie bands? How about 450-plus miles (725 kilometers) worth? 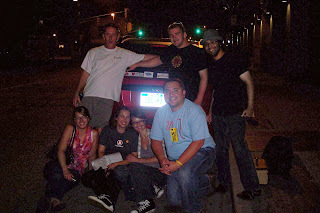 That's how far bloggers dawn.h, ATrain and moniski drove round-trip to see The Mountains & The Trees and the Wilderness of Manitoba on Aug. 11 at Windsor's Phog Lounge. They saw a lot more of The Mountains & The Trees, as they were chauffeured by none other than Jon Janes, the man behind TM&TT. Janes might cringe at the singer-songwriter label (see Russ's spotlight on Janes at NxEW.ca), but troubadours have been around since the Middle Ages-- and longer. There are a few things that make this deceptively simple model successful, but one in particular: the ability to connect intimately with the audience, via melody, words and charisma. Whether it's a room of 200+ (like the NxEW showcase at NXNE in June) or 40 at the Phog, listeners can relate to Janes and the music on his EP (A Hop, Skip & a Jump) and just released, aptly-named, full-length album, I Made This For You. If Janes is grounded in life's poignant everyday moments, the Wilderness of Manitoba soars in an atmosphere of ethereal sound, mythology and Tibetan singing bowls. As a multiphonic instrument, the singing bowl is both complement to and beautiful metaphor for the Wilderness of Manitoba's incredible vocal harmonies, courtesy of Stefan Banjevic, Scott Bouwmeester, Melissa Dalton, Sean Lancaric and Will Whitwham and their various instrumental talents. We were especially impressed with Lancaric's unique approach to drums/percussion. Their talents aren't limited to music; Dalton created the art and cover design of their full-length album released in June, When You Left the Fire. Meet the R3 bloggers: left to right, back row, CDNz1 (Russ Gordon), themountainsandthetrees (Jon Janes) and Wapuche (Patrick Parker). Front row, left to right, ATrain (Alysson Tighe), moniski (Monica Skorupski), dawn.h (Dawn Hill) and jojodillon (Yort is behind the camera). More photos to follow as the wayward backpack/camera bag returns home. Thanks again! Oh, the phun you can have with Phog spelling puns. But that's nothing compared to the fun you'll have and great music you'll hear at Phog Phest 2 this coming Saturday, August 14 at Windsor's Phog Lounge. Ten bands for $10! There's been a slight change to the line-up-- Raised by Swans out, Red Rows in-- still culminating in Grand Analog, Magic Hall of Mirrors and Young Rival. Phabulous! See you there. We're having show withdrawal! It's been almost three weeks since Yukon Blonde on July 22 so we are ready for The Mountains & The Trees and the Wilderness of Manitoba (plus opener G.V. 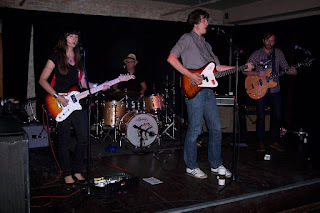 Manury) this Wednesday, Aug. 11, at Windsor's Phog Lounge. The Mountains & The Trees' (otherwise known as Jon Janes) new-- and first-- full-length album, I Made This For You, will be officially released Aug. 10. 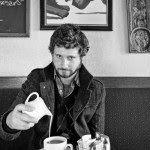 The hype machine is in full swing for Jon's sweet, poignant singer-songwriter take on life's universal moments (can you say "Next Dan Mangan?" No pressure, Jon, no pressure). Paired with the Wilderness of Manitoba's hauntingly beautiful folk-experimental-French pop (from their MySpace page description), it will be an ear-pleasing evening.